Earned 31 assists in her redshirt junior season, good for 2.58 assists per set … Started off the season with 2 assists and 2 digs against Wisconsin (8/25) in Minnesota … Picked up 4 assists against TCU (8/31) at the Colorado State Tournament … Recorded a season-high 13 assists in FSU’s five-set match against CSU (9/1), adding on an ace and 4 digs … Started in FSU’s match against crosstown rival Florida A&M (9/8), recording 4 assists and a dig in the Seminoles’ three-set victory over the Rattlers … Earned 4 assists for the fourth time in the season against Wake Forest (9/23). 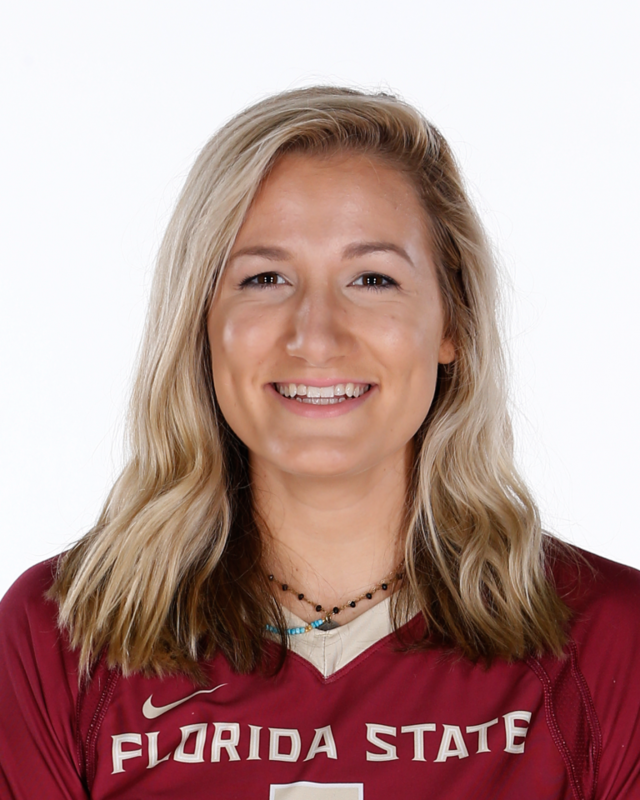 Played in 70 sets in her first season as a Seminole … Amassed 225 assists (3.21 per set) … Her total assists and assists/set both ranked second on the team … Ranked in the top five on the team with 113 digs … Recorded three 20+ assist outings … Recorded 10 10+ assist outings … Made her FSU debut in the team’s conference opening weekend, leading the Seminoles to two wins over Virginia (9/22) and Virginia Tech (9/24) with two kills, eight assists and one service ace … Led the team in assists for the first time in the Seminoles’ sweep over Miami (10/4) with 22 assists … Set a season high record with 14 digs against Duke (10/15), one of two 10+ dig performances … Tied her season high of 22 assists against Notre Dame (10/20) … Added nine assists to the Seminoles’ four-set battle against Washington State in the First Round of the NCAA Tournament (12/1). Made her collegiate debut in Spring Hill College’s 3-0 sweep over Mississippi College where she recorded 36 assists as the primary setter and five kills on nine attempts (.556)… Led the Badgers to a perfect 18-0 conference record, its second undefeated season since joining the SIAC in 2013… Played in 30 matches (79 sets) and started in 25 matches… tallied 752 assists, 52 kills on 112 attempts (.384), 25 service aces and 142 digs. Sat out court season due to injury. Prepped at Ursuline Academy in St. Louis, Mo., under head coach Gretchen Moser … 1st team All-Conference … 1st team All-District … MVP … nominated to All-Tournament team … Team Captain … Four-year Athlete Award … Honor Roll. Born April 17 … Majoring in psychology with a minor in business marketing … Favorite food is mahi mahi … favorite movie is Miracle … favorite TV show is Grey’s Anatomy … favorite musician is Taylor Swift … enjoys baking, crafting, knitting and painting … likes baseball … favorite professional athlete is Mia Hamm … sister to Jimmy … daughter of Jim and Julie Tietjens.